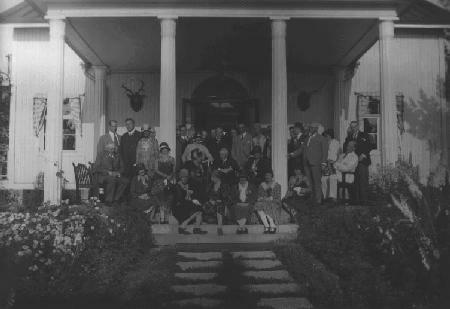 Stormhällan in Hanko, Mannerheims residence in the 1920s. While Mannerheim was Regent, his official residence was the former palace of the Governor General, which was located in Helsinki in Etelä-Esplanadi, and which had been named Smolna in connection with the attempted coup d´etat of 1918. After the War of Independence he resided in Helsinki: in the Brummer house in Aleksanterinkatu in 1919 and in the Borgström house in 7, Mariankatu from 1920 till 1923. Owing to rheumatism and other illnesses, he often stayed abroad, and visited the Runni Spa in northern Savo for cures. In the 1920s he purchased a seaside villa near Hanko and also became the owner of a cafeteria. From 1923 on, Mannerheims permanent resident was a villa in Kaivopuisto, Helsinki, a museum at present. While President of Finland, he also resided in Tamminiemi near the centre of Helsinki. This house is nowadays the museum of President Urho Kekkonen.